Stallions hit the ice this weekend, starting with a Friday night road trip west, to Seaforth, as they visit the fort to take on the Seaforth Generals. "Seaforth is always a tough building for us to play in. Not sure what it is, or why, it just is. Same thing would happen to teams in the pros and OHL that I was apart of. Can't explain it, it just is what it is. We have to be ready to go. No more excuses going forward. The time is now, and we have to be ready and willing to do it. " said Head Coach Sylvain Cloutier. "They're a young team. Who work hard. It's on us to be better though. We had that layoff for a few weeks, and it showed in our game last weekend (vs Muskoka). We can't afford a slow start and sloppy play like we had last game. Need to be better, and that starts tonight" said GM and Assistant Coach David Lang. The Generals and Stallions faced eachother once so far this season, back on Sept 29th, which ended in a 15-1 victory for the Herd. This one should be a lot different, as both teams have changed quite a bit since then. 7:30 pm puck drop in Seaforth! Saturday night will be clash of two CPJHL titans, as The Herd will host the Maniwaki Mustangs at 7:30 pm at the Angus Rec Centre. They have played 4 times so far this season, with the Stallions taking 3 of 4. Stallions have won 3-0, 5-4, and 11-8. While the Mustangs claimed a 4-3 victory in OT. 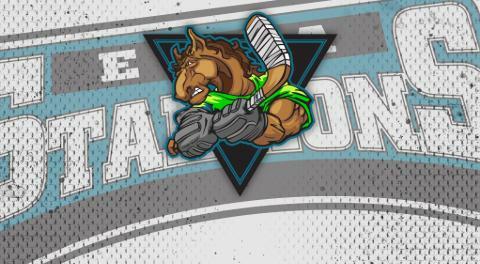 This game will also see two of the CPJHL top point getters, in Stallions F Tim Holmstrom and Mustangs F Anthony Bedard. See you at "The Barn" on Saturday night!